Another week, another smorgasbord of tech and startup events to keep you happily networking away. Last week we had NY Tech Day here in NYC, which was a day-long exposition of all things tech in New York. 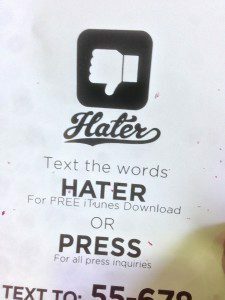 Of all the weird, quirky and down right dumb products I came across at NY Tech Day, my personal favorite is the Hater app. Yes, now there’s an app that allows you to share the things you hate. Let the hating begin!